Material: Eyeshadow palette, mascara, jumbo crayon, nail polish, lipstick, gloss and stencils. Other Sets: "Take Me Home"and "Midnight Memories". 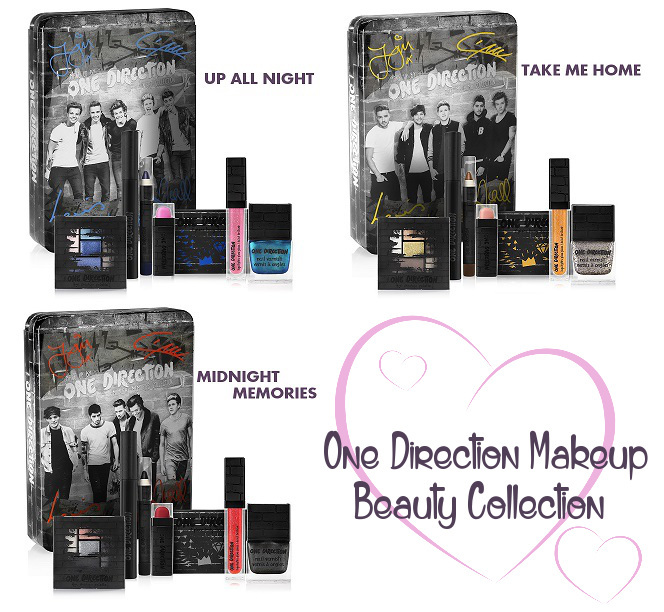 They also have gloss and nail polish sets available at Macy's & Dillards. "I wanna stay up all night and jump around until we see the sun".. don't we all? I am assuming from the title you guys already know what this post is about. I am a bit late on this post since the collection has been out since the holidays but here is my honest review. The collection contains four different sets and I believe they recently came out with a set of lipglosses. The collection comes in a keepsake metal tin with a grey brick pattern on the outside. The tin comes in a clear sleeve with a One Direction photo on the front as well as their signatures. On the inside of the tin there is a guide with 3 different eye looks and a description of each product under the lid. There's also a plastic setting inside where the products are placed in but can be removed to use the tin however you like. The "Up All Night" collection contains the blues and pinks out of the three tins. The products look very promising in packaging. You basically have most of what you need for a complete make-up look. You get a single palette that contains four shadows and one cream shadow/liner. The shadows have a shimmer/frost overlay on top. I was a bit disappointed about this because I thought that it would be the same throughout the entire eyeshadow. With the overlay it is quite pigmented but when I swatched the product the second time, it wasn't very pigmented at all and it was quite chalky. The same goes for the 'glitter' cream shadow/liner. 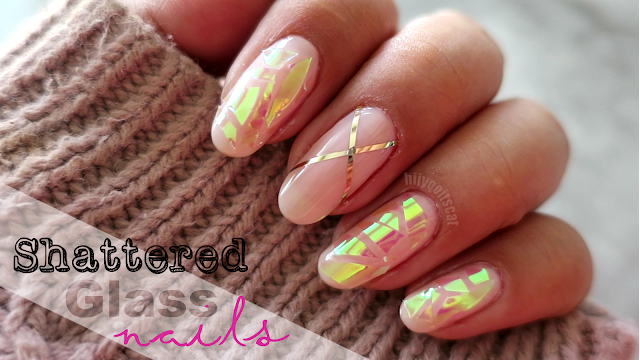 The glitter is only an overlay (meaning it's only on the top layer). The jumbo crayon in the collection can be used as a cream shadow, liner and to fill in the tattoo stencils. It is quite creamy and pigmented, it should be set with an eyeshadow though so that it does not smudge or fade. "Stand Up" is really similar to ELF's Jumbo pencil in 'Like a Boss". I didn't have any high hopes or expected too much from the "Little Black Dress" mascara, however, it isn't too bad. The formula for this shadow is very light. It doesn't seem to weigh down my lashes too much. It also adds a little length to my lashes but does not add any thickness to them. This mascara is certainly not waterproof. This would not be a go to mascara for me.. since I prefer waterproof. "I Should've Kiss You" is a matte bubble gum pink lipstick with a blue undertone. It's a bit difficult to apply since it is not creamy. With this lipstick you have to make sure that you exfoliate your lips really well as well as keep them hydrated. Due to the matte-ness and shade of this lipstick it will definitely enhance any imperfections on your lips. The 'Taken' liquilights glow gloss is probably my favorite product out of the collection. It's a gorgeous pink glitter lipgloss. It isn't too much glitter and the gloss is build-able for a sheer look or a more intense look. The cool thing about this lipgloss is that it glows neon orange. The downside is that it only glows under a UV blacklight, which is pretty lame. It would proboably be better if it glowed in the dark without a black light. This will probably be one of my go to glosses for this upcoming spring. "Na Na Na" is a sheer metallic aqua blue varnish. I believe the swatches below were 3-4 coats. It is a really pretty shade and fits in really well with the whole collection. This 5 piece stencil set can be used anywhere on your body. You can use the jumbo crayon or the shadows to get the pattern. I haven't tried out any of the stencils but I like the diamond sheet the most. I like that they offer two different sizes for each design. Each stencil is probably the same size as a deck of cards. The "Up All Night" collection received the three heart approval. I do like the keepsake tin but that isn't the important part of the collection. The most anticipated section of this collection is the makeup and I have to say that the beauty products did not live up to my expectations. If you have been following my blog for a while then you know that brands and prices don't mean much to me as long as the make-up is great. This set just didn't do it for me. The only products I see myself using is the lipgloss and the nail polish. I feel like this set is better as a gift or for someone that likes to play dress up. This collection is fun with the blues and pinks but I would have preferred one of the more wearable collections. As I stated previously, the small palette would have been better if the shimmer was through the shadow and not just a pretty overlay. The lipstick was a bit too drying and unflattering for my taste. As for the mascara and jumbo crayon, I didn't have any issues with them but they just did not wow me. The stencils are a nice added bonus but are not necessary. As I said before, this set is great for someone that enjoys dress up or even someone that wants to slowly ease into bolder shades. So what do you think? Would you purchase this for yourself? or as a gift?